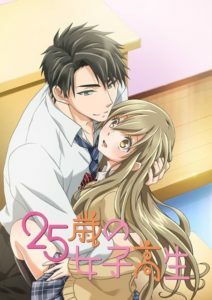 Through the request of a relative, Hana Natori is attending high school at 25 years old, taking the place of her cousin who can’t attend due to certain reasons. There she meets her former classmate Akito Kanie, who is now her teacher. A hot love-story unfolds. The anime will follow the same format as the Fall 2017 anime Omiai Aite wa Oshiego, Tsuyoki na, Mondaiji. On TV a censored version will air, and an uncensored version will be available on Comic Festa Anime Zone. Both versions will have a different cast.